family-run business, we pride ourselves on the quality of our food, our high standards of service and the friendliness of our staff. And we offer something for everyone – whether you are looking for a great place to drink, a great place to eat, or a great place to party! as Stirling Castle, the Wallace Monument and Bannockburn Heritage Centre, we’re perfectly located for locals and visitors alike to come and enjoy our unique and friendly atmosphere. 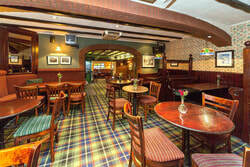 Come and enjoy a relaxing drink in a traditional local Scottish public bar. 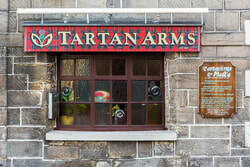 The Tartan Arms offers a warm welcome and friendly atmosphere and serves a full range of alcoholic and non-alcoholic drinks, including a great selection of quality Scottish whisky. Bar lunches are available every day of the week and food is available all day on Thursday, Friday, Saturday and Sunday (see the Food tab for serving times). Choose from a range of classic pub dishes - including our famous steak pie – with something to suit every taste. Find details of our menu, hot drinks and wine list in the Food section of our website. Saturday night is party night at McQ’s! Our famous weekend Cabaret Nights will have you dancing until the wee small hours. With a different act every week, you can choose from tribute acts, cabaret acts and the best local bands. There’s something for everyone at McQ’s. You can round off a great night out at our disco, which is open until 2am. So, whether you’re looking for a hearty meal, a great place to party or just somewhere to enjoy a quiet drink with friends, look no further than the Tartan Arms and McQ’s in Bannockburn, Stirling.